By not up-grading the quality of their soap to maximize income. Making soap at home is popular. This is the key to making homemade soap and turning it into a real business. The first thing Paula, from Orange County, California did prior to starting a soap making business was to visit gift shops, flea markets, craft shows and go online to determine the popularity of different kinds of handmade soaps that were attempting to be sold. Two excellent sources for her research were the online sites of etsy.com and eBay.com. When I chatted with her recently, she relayed that what she found was essentially the same type of handmade soaps presented with a different twist as a marketing angle designed to get sales. She felt that if her attempt at making homemade soap and making it produce more than pocket change, she was going to have to offer a vastly different type of approach…a specialty market! 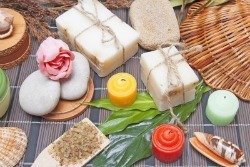 Starting a soap business by making true specialty soaps is not harder to do. It just takes a desire to look a little deeper into what kind of soap is needed by consumers, finding related recipes, and adjusting some of them to find the right one for you. Paula said that she had to make the effort to find truly niche audiences for little known soap making opportunities. This is the basis for starting a soap making business. She found some, which I share with you. Paula decided to focus her efforts on Vegan and Insecticidal soap making. She realized that the customer base for these soaps is much smaller than the mass-market appeal of traditional handmade soaps. Her plan (and she followed through on it) was to up-grade the quality of her product and to market her soaps mainly on the Internet and in high-end specialty dress shops (yes, dress shops). While Paula keeps her quality secrets to herself, she did tell me that she uses artesian well water and distilled water only plus certain French clay ingredients to make superior products. He told me she had huge doubts about the value of having a "business website" rather just a traditional website. She had no clue, absolutely none, about how to do this Internet thing! Besides, she did not have a ton of extra money that she thought would be necessary to create her own website. Just short of 4-years ago she came across my website and a page on it about how to start an Internet business. Paula said she was hooked and the rest is history. Paula had no idea that thousands of people every month search on the Internet to buy Vegan and Insecticidal soaps. These are people who are searching to buy handmade soap. All she had to do was build a Web business that would get found by such people. Today, Paula works exceedingly hard to keep up with soap orders. She ships worldwide. To date, it’s 64-countries. And to think, she had no clue how to build a website! Oh, why does she choose high-end dress shops to sell her soap products? Plain and simple, she says. Her retail is 8-times her cost of making her products. 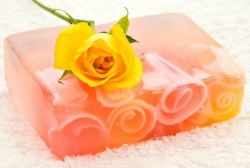 This market can well afford her soap, plus, to the dress shop, it is a novelty item that matches their upscale setting. I want to publicly thank Paula for sharing her experiences. I wish you well in starting a soap making business.